He entered Capernaum after some days, and it was heard that He was in the house. Immediately many gathered together, so that there was no longer room to receive them, not even near the door. And He preached the word to them. Then they came to Him, bringing a paralytic who was carried by four men. And when they could not come near Him because of the crowd, they uncovered the roof where He was. So when they had broken through, they let down the bed on which the paralytic was lying. Jesus then asked which would be easier to say to a paralyzed man, “Your sins are forgiven” or “Stand up, pick up your mat, and walk”? ‘This is an unanswerable question. The statements are equally simple to pronounce; but to say either, with accompanying performance, requires divine power. An imposter, of course, in seeking to avoid detection, would find the former easier. The paralytic had not sinned against the man Jesus; the two men had never even seen each other before. 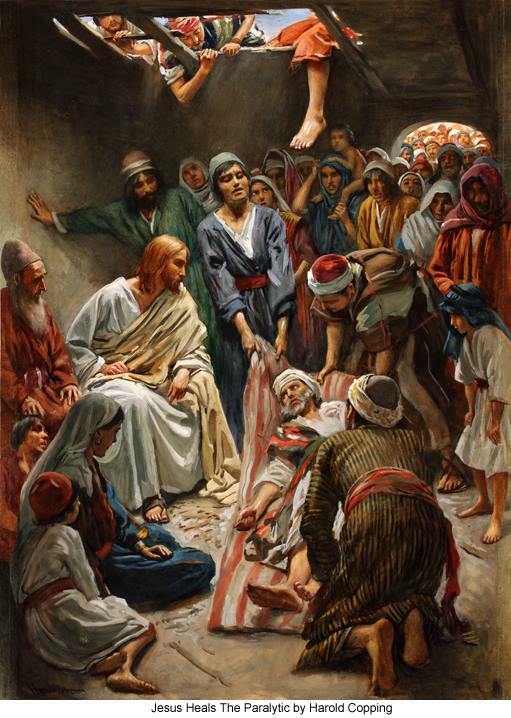 The paralytic had sinned against God. Then along comes Jesus, who under His own authority says, “Your sins are forgiven.” We may forgive sins committed against us personally, but in no way can anyone forgive sins committed against God except God Himself. Yet this is exactly what Jesus claimed to do. It is no wonder therefore, why the Jewish leaders reacted so violently at these claims Christ made.